The Russian fishing trawler LLV Azurit lost propulsion power in Barents sea on 35 nautical miles southwest off Bjornoya island. The vessel’s propeller fouled into a fishing nets and suffered damages, leaving the trawler adrift in the rough seas. The crew reported about the accident to local authorities and owner arranged towage to Murmansk. The vessel remained adrift for two days since the accident occurred, but crew is safe and there is no immediate danger for her seaworthiness. The local rescue coordination center ordered a nearby fishing trawler to support the troubled LLV Azurit until the tug arrives at the scene of the accident. The investigation for the root cause of the accident is under way. There no immediate danger for the ship LLV Azurit, but bad weather and heavy seas may worsen the situation in any time. The crew on board has enough fuel and provisions. There are no injured people during the incident. The Russian fishing trawler LLV Azurit (IMO: 6808674) has overall length of 40.00 m, moulded beam of 8.00 m and maximum draft of 5.00 m. The deadweight of the vessel is 187 DWT and the gross tonnage 466 GRT. The ship was built in 1967 by Nielsen Mekaniske Verksted in their shipyard in Harstad, Norway. 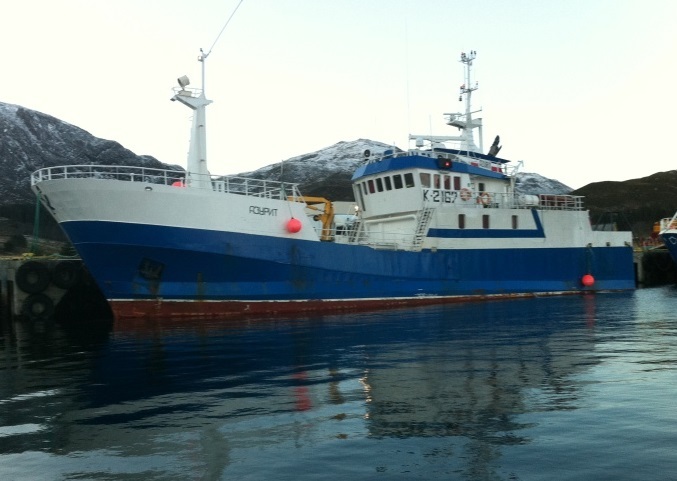 The owner and manager of the trawler LLV Azurit is Russian company Okeanprom.